The year was 1946 - Ten years after the death of his father; nine years after the Ohio River Flood, the death of his wife, Hope, and his daughter, Sharon Rose. 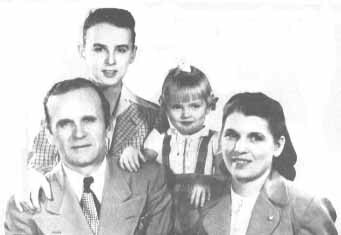 But 1946 would be the year of "new beginnings" for William Branham, his family and his ministry. This Kentucky Hillbilly would be moved "Front and Center" of a "Signs and Wonders" Revival that would sweep around the World. The new beginnings would start with the birth of a child. Through Sister Meda, God had restored to him the faithful wife William Branham had lost in his first marriage, Hope. Now, God, in type, restored to him the little girl he had also lost. On March 21, 1946, Sister Meda gave birth to a little baby girl - the infant was named Rebekah, meaning "captivating". She captivated the heart of the young preacher who was still a captive of past sorrows - but once again God comforted His servant. Less than two months after the birth of his daughter Rebekah, there would be a "New Beginning" for his ministry - the ministry he neither sought nor wanted. This ministry wasn't just "a calling" he received 'after' his conversion; It was predestinated, fore-ordained before the foundation of the world. Like Jeremiah, "he was ordained a Prophet, even from the womb" (Jeremiah 1:5). On May 7, 1946, Brother Branham had an experience in the front yard of his home which compelled him to go to his Cave to seek answers from God concerning the peculiar Anointing that had followed him all the days of his life. It was there, that night, in the cave, that An Angel was sent from the Presence of God to explain to Brother Branham (in part) what his ministry was all about. The visitation of this Angel became the spring-board for the Healing Revival that would sweep accross America and around the world. Brother Branham's obedience was put to the test again as it was in 1934. He had established a small church in Jeffersonville, Indiana; he was well known as a preacher in the local area; he was married to lovely young woman; he had a young son; now, their marriage was blessed by the birth of this little girl named Rebekah. She was just six weeks old when he received his commission from the Angel. BUT William Branham had learned his lesson in obedience. He kissed his wife, son and little girl good-bye and ventured forth accross the nation to preach the Gospel of our Lord Jesus Christ. Little Rebekah would be six months old before he saw her again. Jjust a word for her. She saw her first vision about two weeks ago. One night in Hammond, Indiana, she was crying. They got me out of the meeting - I was about to pass out myself; And I said, "What's the matter, honey?" And she said, "Daddy, She's way back up in the balcony. Some poor old woman, laying on a stretcher - And you said, 'All that wants to be healed, raise up your hand.' But you couldn't see her. The crowd stood up and you couldn't see her." That poor little heart was breaking. And I said, "Well, honey, she didn't raise her hand. Jesus saw her." She said, "But, daddy, You didn't see her. And she wanted you to see her." I said, "It'll be all right. Jesus will heal her." And this girl that was healed the other night, I didn't know Rebekah was there, 'cause I couldn't even see it. But she said, "Daddy, when you called, when you called those prayer cards, she commenced to crying," said, "her number wasn't called." And little Rebekah was setting right in behind the chair. I believe that's right, Sister Woods, you know. She was setting right in behind the chair back there, praying that God would help this poor girl. And there she is come across and she was healed right there. Looks like I'm going to have a woman preacher sure as the world in the family. So there it is. All right. No, she wasn't destined to become a Woman preacher but there was a work for her to do. She had seen and witnessed much in the life and ministry of her father. She was just a teenager of 19 years old when her father passed away. Shortly after her fathers passing, she married Brother George Smith who would become a vital part of a work which would be ordained to carry on the Worldwide Ministry of God's Prophet. Just prior to his passing in December of 1965, Brother Branham had bought, decorated, and furnished a home in Tucson. He had stated that it was for his family. He had never lived in it himself. During the move to the New home, Brother Branham had gathered and boxed items (related to his ministry - papers, magazines, photos, etc.) that he had collected over the years - this he presented to Sister Rebekah. Perhaps he knew that at some future date that she and her husband would need this information to do their part in continuing the ministry of Malachi 4:5-6. Gleaned From Information, Found in a number of Recorded Sermons by William Branham. These sermons are re-produced and distrubted by Voice of God Recordings in Jeffersonville, Indiana.